The U.S. Internal Revenue Service calls the scam its No. 1 fraud. Identity thieves are using stolen personally identifiable information to file victims’ tax returns and then receive their refunds. Here’s how they do it and ways to combat and prevent it. Katie Winston, who held an MBA degree from Harvard University, was a very successful broker for a large firm on Wall Street. With tax time approaching, she gave her records and receipts to her longtime tax specialist to ensure she would comply with the income tax code when she filed her return. Normally, she would receive a refund. But this time the Internal Revenue Service (IRS) sent her a notice stating that “More than one tax return for you was filed” and informing her that it had already issued a refund check in her name. After she spoke with her tax professional and an IRS agent, she realized that she was the victim of an identity theft tax refund scam. According to the IRS document, “Taxpayer Guide to Identity Theft,” an identity theft tax refund scam “occurs when someone uses your personal [identifying] information [PII] such as your name, Social Security number [SSN] or other identifying information, without your permission, to commit fraud or other crimes.” The scam usually occurs when “an identity thief uses a legitimate taxpayer’s identity to file a fraudulent tax return and claim a refund. 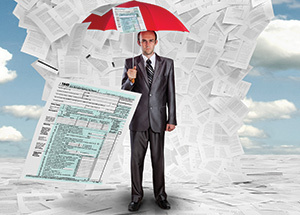 Generally, the identity thief will use a stolen SSN to file a forged tax return and attempt to get a fraudulent refund early in the filing season.” By filing the fraudulent tax return early, of course, the identity thief usually receives the refund before the victim sends his or her tax return, and the IRS processes it. Thanks to paperless e-filing, this scam is easier to pull off than ever before. Thieves can simply make up phony wages or other income, submit the information electronically and receive the fraudulent refund via mail or direct deposit within a month. Of course, the IRS keeps records of earned wages and other types of taxable income reported by taxpayers’ employers and other organizations. However, the IRS doesn’t match these records to information submitted electronically by identity thieves until several months after it issues refund checks. By the time the IRS tells the victim that it has received another tax form in his or her name, the thief has cashed the refund check and is long gone with the money. The identity thief wins, and the U.S. Treasury and the victimized taxpayer are the losers. What will happen if a fraudster uses your PII to commit this crime? Well, to begin with, you probably won’t receive your tax refund within the normal time period. (See “Identity theft and the IRS, or, Who got my refund?” by Linda Stern, Reuters, March 13, 2013.) You’ll first need to go through the process of confirming your identity with the IRS to collect your refund. According to a Nov. 7, 2013, report by the Treasury Inspector General for Tax Administration (TIGTA), the IRS took an average of 312 days to resolve tax-related theft cases closed between August 2011 and July 2012. The report shows that the government was still losing $3.6 billion a year in potentially fraudulent tax refunds. That’s down from the $5.2 billion in potentially fraudulent refunds that the IRS issued in 2011. In conjunction with the release of the TIGTA reports, Sen. Bill Nelson, D-Fla., renewed his “call for an increased government crackdown on identity thieves who use someone else’s name to steal their tax refunds.” Nelson re-filed his legislation, the Identity Theft and Tax Fraud Prevention Act of 2013 (S. 676) in April 2013, which would toughen criminal penalties for ID thieves who file fake refunds under someone else’s name. It would also require the IRS to get legitimate taxpayers the refunds they’re due within 90 days. That would certainly provide some relief to financially strapped victims. “While these reports show that some progress is being made in reducing tax fraud, it’s also clear that there is still much to be done and there are still a number of improvements that need to be made to protect both taxpayers and the U.S. Treasury,” Nelson wrote in a Nov. 7, 2013, letter to Sen. Max Baucus, D-Mont., chairman of the Senate Finance Committee encouraging him to prioritize Nelson’s bill. This scam’s consequences don’t end when you travel through the process of confirming your identity with the IRS and receive your refund. After all, someone has stolen your identity and your PII is good for more than just filling out a tax form. Identity thieves may also use it to obtain credit/debit cards in your name, take out loans or mortgages, get jobs or even declare bankruptcy. The odds are very high that an identity thief won’t pay off any debts they incur in your name, which will leave you holding the bag while the fraudster skips off into the sunset with his (your!) loot — free and clear. He can destroy your credit rating and make it difficult or impossible for you to negotiate the economic seas. You’ll spend hours and hours clearing your record and lots of cash if you need to hire an attorney to help. TIGTA’s projection appears to have some validity because the IRS mailed out $4 billion in refund checks to identity thieves in 2013, which represents 1.6 million victims identified through June 1, 2013, according to the TIGTA. In 2012, the IRS issued 1.1 million refunds to people using stolen SSNs, which resulted in fraudulent tax refunds of $3.6 billion. This compares to 2011 when the IRS issued $5.2 billion in refunds to people who stole SSNs. In addition, according to a Sept. 20, 2013, TIGTA report, the IRS issued 141,000 refunds totaling $385 million in 2012 to people using stolen taxpayer identification numbers, which foreign citizens, who earn money in the U.S., typically use. In its study of the 1.5 million additional tax returns noted above for the 2011 tax- processing year, the TIGTA identified five addresses that accounted for 4,864 fraudulent tax returns and $8,104,493 in tax refunds. One address was located in Lansing, Mich., where there were 2,137 fraudulent tax returns representing $3,316,051 in refunds and the others in Chicago, Ill., (765 and $903,084), Belle Glade, Fla., (741 and $1,104,897), Orlando, Fla., (703 and $1,088,691) and Tampa, Fla. (518 and $1,791,770). In addition, the IRS sent a total of 655 tax refunds to a single address in Lithuania, and 343 refunds went to a lone address in Shanghai, according to the ITGTA report for the 2011 tax-processing year. Also included in the TIGTA study noted above were categories for the types of individuals whose identities appear to have been stolen, including individuals who weren’t normally required to file a tax return. These categories accounted for 1,492,215 tax returns with estimated refund losses totaling $5,221,018,184. The five categories included the deceased with 104,950 fraudulent tax returns and $415,047,568 in refunds, followed by the elderly (76,388 and $374,419,730), citizens of U.S. possessions (76,338 and $374,419,730), students, ages 16 to 20 (252,288 and $695,043,022), children under the age of 14 (2,274 and $3,960,327), and those whose income level doesn’t require tax return filing (952,612 and $3,345,064,109). It’s obvious from these stats that the elderly, students and young children are easy identity theft targets because many of them don’t meet the income requirements to file a federal tax return. According to the 2013 TIGTA report cited above “the IRS continues to increase its efforts to identify and prevent fraudulent tax refunds from being issued as a result of identity theft.” The report mentions that during 2012, the IRS prevented the issuance of $20 billion of fraudulent refunds, including $8 billion related to identity theft, compared with $14 billion in 2011. The IRS says it stopped more than $12 billion in fraudulent refunds from going to identity thieves in 2013. Hopefully the IRS’ efforts will result in even better future results. Outline of how fraudsters hit congregations and ways congregations can avoid becoming victims while still helping those in need. Overview of the latest stats from the FTC's Consumer Sentinel Network Data Book.